How could we not feel pride reading this document, those powerful words? 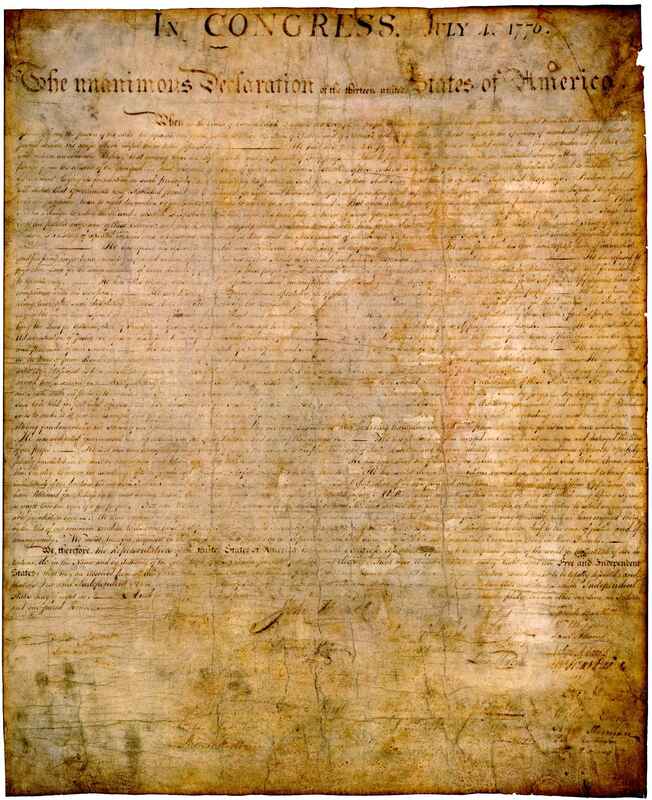 Although, as a country, we may have gone astray, this document is how it all started. I find myself wondering how many of our senators and representatives have actually read this. How many voters have read this and taken this to heart? The things said about the King of Great Britain? Some of them... um... sound a little too... um.... relevent to today. that was creepy to me. I was thrilled to open this page and see those beginning words. This document is so moving, and really reminds us why we started this experiement in the first place. "Consent of the governed" being used very loosely these days. For a minute, I thought that you put in the opening paragraphs and then para-phrased regarding our current leadership. But, yes, God Bless America. Taste - I think you're right that many people (our elected representatives included) have never really read this whole document. Painted & Jenn - I kept thinking of GWB as I was reading through it too. Scary stuff. Scary stuff. Moondance - Just call me a geek too! I have one of those copies you can buy as a poster up on my office wall too. --Thomas Jefferson. like my friend Kevin said today, maybe we need live the revolution on a more daily basis. . . Thank you for posting this. Everytime I read that or hear it read I feel a deep connection to what this nation is supposed to stand for. Thanks for posting this...I wish I thought to re-read this kind of thing more often. Its a great reminder. Thanks too for commenting on my Karma post. It scares me too. what a wonderful post for July 4th! I'll have to look up the essay I wrote for the Navy MWR contest based on this. Too funny on the comments above. It made me think also of GW and my bumper sticker: Frodo Failed, Bush has the ring. So I'll just say that it's a brilliant document, and I only wish our elected officials would read it once in a while. As well as the Constitution and the Bill of Rights. Thanks for the post - I haven't read that document in a long time. For those interested "Common Sense" by Thomas Paine started the whole thing. We invited a few Americans and many Brits over to celebrate. It was a wonderful evening (remember, it was a work day here) and everyone (including me!) kept our political comments (about King George - in fact, both of them)to ourselves for the duration. Hope everyone had a wonderful 4th!